I loved everything about our trip to Barcelona in May but one of the things that I enjoyed the most was the oh so delicious Catalan cuisine. This soiree is inspired by the incredible food of both Catalonia and Spain and is a relaxed evening of friends, good food and spirits. This menu is intended to be light and is designed to all be eaten without the use of utensils. 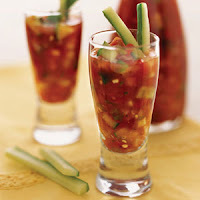 Gazpacho shooters (see Wednesday's post for Gazpacho recipe). Top shooters with chopped hard boiled egg or cucumber sticks. Prepare this at least a day in advance, to ensure proper flavor and less stress for you on the day of the soiree. Preheat grill or broiler. Slice ciabatta crosswise into 4-6 pieces, then cut each slice horizontally. Place the bread on grill rack or on a baking sheet. Grill or broil, turning once, until golden brown on both sides, about two minutes on each side. While toasts are still warm, rub them on one side with cut garlic halves. Cut each tomato in half. Rub the cut sides of tomato on top of the toasts until only skins are left, then discard skins. Drizzle with olive oil and sprinkle with salt. Selection of Spanish cheese, meat and quince (membrillo in Spanish). 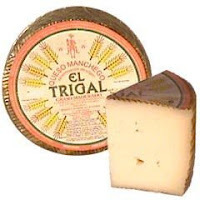 I would use Manchego, thinly sliced Serrano ham, and quince. Also serve salty Spanish almonds on tray. Fear not- you can buy all of these items at your local gourmet store. Season shrimp with salt and pepper and drizzle generously with olive oil. Place a griddle over high heat until hot. The griddle is ready when a drop of water flicked on the surface evaporates instantly. 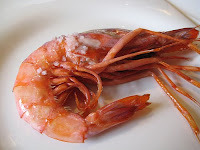 Place the shrimp on a hot surface and cook, turning once, until they are opaque throughout and the shells begin to brown, about 5 minutes on each side. Sprinkle with garlic and parsley; cook, without stirring, for about 30 seconds; and then turn shrimp one last time. Transfer to a warm platter and serve at once. Makes 4 servings. Drink: Sangria (for recipe, click here ), Cava and sparkling water. Decor: Think simple, colorful and soft lighting. Use an abundance of tea lights to create a twinkling effect. My sunflowers are in bloom, so for flowers, I would make bouquets out of the them and place in various locations. Small plates are best for this night. 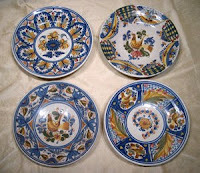 Why not use a collection of brightly colored salad plates for a fun look. 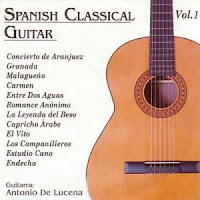 Music: Spanish classical guitar. If your budget allows, hire a classical guitarist to come to the party and play. If not, a cd is perfect! I would wear something along these lines. All three dresses can be found at edressme.com. I would wear flats of some sort to allow for easy mobility and miles of gold bangles for a bit more relaxed look. What more information about one or all of these fabulous dresses? Just click on the image for the scoop. Want to know my picks for Barcelona? Check it out here and read a bit more here. This entry was posted on 7:42 AM and is filed under dinner parties , dinner party ideas , saturday soiree , spanish fiesta . You can follow any responses to this entry through the RSS 2.0 feed. You can leave a response, or trackback from your own site. love it all- the decor, the food... fabulous! You left no stone unturned - what a terrific soiree it would be. The menu sounds delish. I have yet to visit Spain but the hubbie was in Madrid for a month before we married. He would love to live there. Fun weekend to you CH! those plates are So pretty! Beautiful party! I love Manchego cheese and Sangria! What a lovely theme. I love real spanish food not that over flavoured fakery from 'tapas' bars. Bring on Summer!!! Love the party set-up - and I'd always want to be at an event with gazpacho! Now that is a soiree I would love to attend, especially wearing that gold trimmed number. Gorgeous! These recipes look delish and I've been in love with that pink Manoush dress for ages now!! Such a fab dress. Oooh - I just love everything Spain. If it wasn't so far from Oz I'd be there all the time! Your post has bought back lovely memories for me! Oh I adore this! I was in Barcelona in July and am in serious tomato bread withdrawal...I really need to get on the horn and make some of this. What a gorgeous post. I actually haven't been to Spain. Missed that one for no known reason. Well I do feel like I've had a taste of it now. The images are great and the food is making me hungry. What an appetizer! Barcelona - I'm so jealous! I love the idea of an outdoor dinner party at a long table where everyone is enjoying delicious food, fine wine and sparkling conversation. Those plates are fabulous, by the way! Loving that first table setting! Beautiful post! 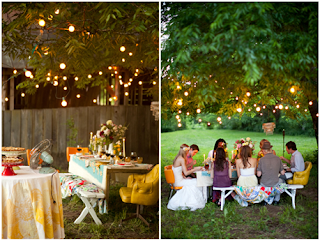 What a fab idea for a dinner party! All of the dresses are so pretty!